We have this full X3 Glass Windshield for when you don't want to settle for any less. We do have some good scratch resistant polycarbonate windshields, and the hard scratch resistant coating does help a lot in preventing scratches - they still scratch over time. 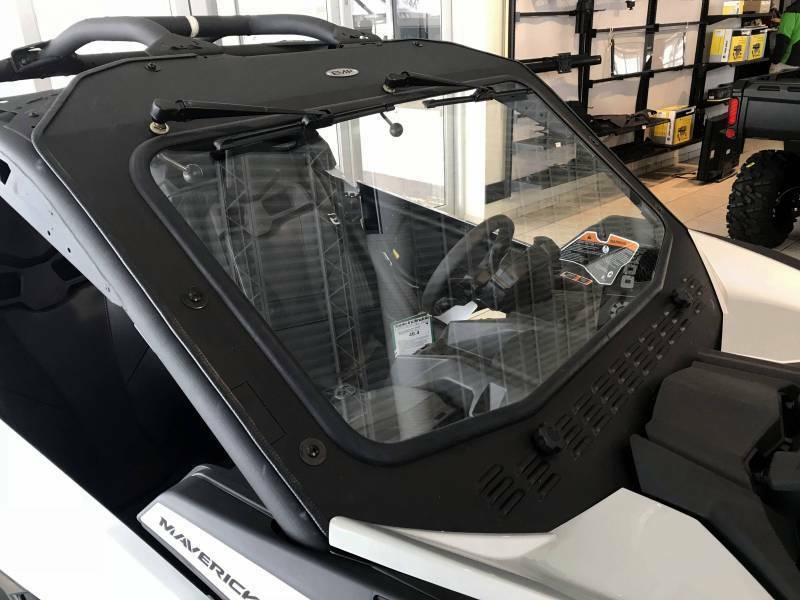 With this Maverick X3 glass windshield you won't ever have to worry about that. You will be able to run through thick brush care free. Now, you have a real Laminated Glass Windshield for your X3. This windshield features Automotive style glass, hand operated wipers, and a slide vent for added airflow into the cab. ¼” Laminated Automotive Style Glass. Lower Slide Vent (open and close positions). Works with the Factory Plastic Top. NOTE: The wipers do not wipe the entire windshield due to the shape of the glass. Who can build a custom glass windshield in SoCal? New In Box BRP Rock Slide Bars FOR SALE!